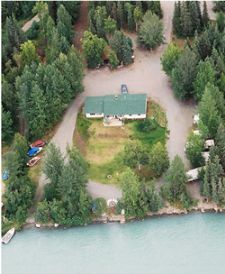 Help Plan My Alaska Trip! Alaska is immense. More than 365 million acres of pure exhileration packed wild beauty sort of immense. If Alaska were placed upon the continental United States it would stretch from Jacksonville, Florida in the southeast, west to San Diego, California, and north to Canada. Simply enormous. The tallest mountains in North America, including Mt. McKinley, or Denali as we call it here, surrounded by over 3 million lakes (think about THAT Minnesota), 100,000 glaciers, and more wilderness acreage than the rest of the United States COMBINED, and more wildlife to fill it than anywhere else too. Pretty immense, eh? Law enforcement in Anchorage receive more calls about moose and bears than they do holdups, bomb scares, liquor violations, escaped criminals, resisting arrest, prostitution and illegal aliens combined. The state capital of Alaska Juneau, is accessible only by boat, ferry or plane. Alaska has more then 3 million lakes. Alaska's state bird is either the ptarmigan or the mosquito, depending on who you ask. Alaska has more then 500 different species of mushrooms. The Alaska ski season lasts from November to May. Sled dog racing is Alaska's state sport. Fifteen species of whales live in Alaska . Alaska has 6 baseball teams. major league players who have been on Alaska teams include: Tom seaver, Mark McGuire, Chris Chambliss and Dave Winfield. Alaska has four climate zones: maritime, transition, continental, and arctic. Glaciers cover approximately 29,000 square miles of alaska (5%). This is 128 times more than is covered in the rest of the U.S..
Coldfoot, Alaska's northernmost golf course, consists of 3 holes and a driving range. Herds of musk ox are allowed to play through. Alaska has 246 recognized tribal governments. Alaska has 124 geothermal areas (hot springs). Alaska's languages include 20 native American languages.